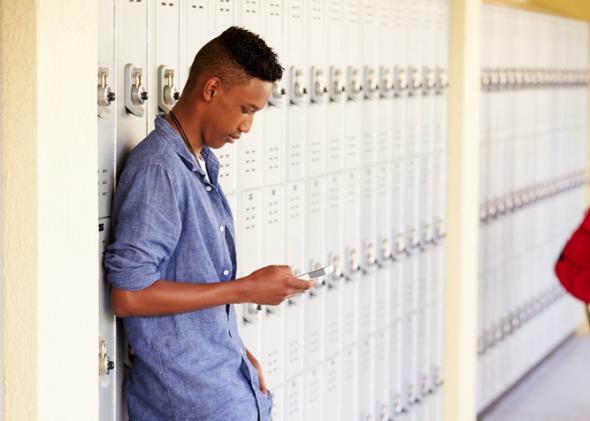 New York City lifts school cellphone ban; here’s how to solve the problem. The New York City Department of Education isn’t banning cellphones any more, but individual schools still could. On Tuesday, Mayor Bill de Blasio—who previously voiced his displeasure with the ban and said he lets his son bring his cellphone to school—said that parents and students should be able to contact one another during the school day. (Encouraging parent-child communication? How progressive!) Critics of allowing phones in school remain adamant that those newfangled smartphone thingamabobs will empower young whippersnappers to cheat and rabble-rouse and probably sext all over the place. But there is a solution. Sandwich bags can solve it all. While de Blasio’s renouncement still allows individual schools to set their own policy, it still asks students to keep their phones hidden. This is a bad idea. In fact, for the first time in my life, I’m totally supportive of an open-carry policy. If teachers want to prevent students from cheating, they should require the tools used to cheat to be in full view. Set on silent, stored in a clear plastic zipper bag, and taped to or placed on the side of the desk. Students won’t be able to cleverly hide their phones, and teachers will be able to detect unauthorized unzipping. According to an unnamed principal at a school with (gasp!) metal detectors, “Kids are going to stage fights so they can put up posts on social media.” One can only presume the principal, speaking on the condition of anonymity, retreated home on his horse and buggy to churn butter for supper. While Luddites may object, allowing phones presents an opportunity to encourage responsible social media use and educate kids about living in a digital age. And as the mayor’s son Dante de Blasio demonstrates, it’s not like kids and parents were respecting the ban anyway. In a city that has experienced everything from terrorist attacks to blackouts, it seems unwise to prevent kids from staying in touch with their families. Allowing them to use those devices responsibly is more than reasonable—it’s essential. And something as low-tech as a humble sandwich baggie can solve this digital dilemma.